Every two years, in the month of December, pain arrives in our shrinking household. In 2008 we lost our dear dog Kali in Puerto Rico, while at the vet. A malicious and very developed cancer made us put her down after an unsuccessful operation and the knowledge she would never be healthy again. In 2010 it was Darwin’s turn, who –unbeknownst to us- was suffering from internal bleeding as a result of a rare and nasty cancer. We had to put him to sleep in the USA, right before returning home to Irie. With no dogs left (other than our toy dog Clarke, who was given to us by UK friend Matt to “replace” our sweet puppies) this year, something had to happen to Mark or me. It was Tuesday, December 11th, when the ladder to board Irie in the boatyard of Shelter Bay marina, slipped away. Mark was starting to descend when it happened, and instead tumbled seven feet down to the gravel ground. It was one of those moments we were happy to own a catamaran instead of an even taller monohull. He fell hard and besides a few bloody scrape marks and cuts, hurt his left wrist. Initially, he seemed shocked, but OK, until the evening progressed. The pain became unbearable and we suspected his wrist was broken. While trying to figure out how to get a cab at night from remote Shelter Bay to an emergency room in Colon, our yard neighbor – a doctor – came over to offer medical advice. Upon inspecting Mark’s hand, he made a diagnosis which required a cast… for at least six weeks; a procedure that would take place in a western country. Our plans, dreams and hopes shattered instantaneously. This would change everything: our time on the dry (which is very expensive, dirty and uncomfortable), our planned three week vacation in the San Blas, our Panama Canal transit, Mark’s upcoming one week visit to the States and even our plans to spend time in the Pacific. We were extremely close to giving up the boat life all together… We hit rock bottom. The following morning, on 12-12-12, we took the marina shuttle into Colon and were dropped off at the emergency room of the Cuatro Altos hospital. In typical Panamanian style, we were “welcomed” at the check-in desk by three women doing each other’s nails without looking up. One was the secretary, one happened to be the nurse and the third proved to be the doctor on duty. After the nail polish was dry enough, we registered and were helped. The air conditioning was not working and everybody was fanning themselves. The nurse did the rudimentary check-ups and Mark disappeared in the “radiation” zone. A hospital employee took four X-rays of his left hand and then it was nervously waiting for the results. We were called into the doctor’s office, who spoke some English, helped by her tablet translator. The X-rays were lit up and she explained the important verdict: no fractures, “just” a sprained wrist. The news also lit up our faces! What a relief! The cleaning lady entered the small room and pointed a fan at the doctor’s desk. When she turned it on, papers flew all over the place. Saw that coming a mile away… We received a note with necessary items needed from the pharmacy on site: stronger painkillers and an immobilizer for Mark’s injured hand. They had the pills, but no immobilizer. Really? Before we set off on a hunt for other pharmacies in the area, we paid our ER bill: $95. The secretary handed us a small receipt and we left. When realizing a more detailed invoice might be necessary in the future if the problem appeared to be more serious after a few days, we returned to the desk. The woman was on a little break and when she returned and found out why we were back, she just grabbed the printed sheet in front of her and gave it to us. ik ben een fan en stille lezer van jullie blog (stil .. tot vandaag). Ik ben blij dat Mark er goed vanaf kwam en hoop dat het niet te veel problemen geeft op het droge. Sterkte! Ik volg jullie avonturen en wens jullie veel geluk. Bedankt voor de steun en de aanmoediging! Marks pols is ietsje beter, ook al gebruikt ( misbruikt) hij hem dagelijks. We hebben ontzettend veel werk op het droge en tot nu toe al heel wat problemen en niet te veel geluk met het weer. Maar, we komen er wel door en hopen toch nog om voor kerstdag terug in het water te liggen! Het allerbeste en prettige feestdagen! Hey you Guys, you've had a bit of a tough go lately. Keep your spirit up, it always gets better. Thank you for your continued blogging. I've enjoyed reading it over the past year. Very well written and it provides an infusion of Caribbean warmth on cold days. We'll have a 10 day charter from St. Lucia end of January, so looking forward to that. Merry Christmas and Safe Travels in 2013! We finally made it back to the San Blas islands for a "little vacation" and are becoming happier every day. :-) Internet not good enough to post any blogs at the moment. Have fun in St. Lucia. Are you taking the boat over to SVG or Martinique at all? It will be great... Reliable trades and awesome scenery. Enjoy, enjoy. enjoy. We do miss that area once in a while. 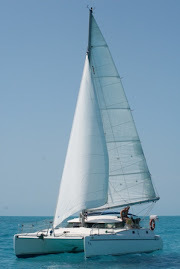 Thanks for reading the blog and happy sailing! We have 10 days so planning a straight shot to Grenada for a stop then work our way back thru SVG to St. Lucia. Plan to have our own boat in 3yrs (yes, that seems like a long time) and will travel at a slower pace then. Enjoy the San Blas again! It's on our list. For now we'll have to be content enjoying it thru yours and the other blogs we read.